Vitamin E has important antioxidant properties and is implicated in protection against the development of age-related diseases. 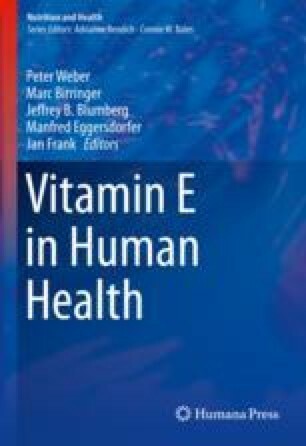 An important problem hampering correct interpretation of circulating concentrations of vitamin E is its affinity for circulating lipids, causing a high correlation with total cholesterol and fasting triglycerides. Many studies correct for this by analyzing vitamin E concentrations as the quotient calculated from dividing vitamin E concentrations by total cholesterol plus fasting triglycerides, hereby negating the possible introduction of error from double correction for variance shared by total cholesterol and fasting triglycerides. We therefore set out to compare correlations of circulating vitamin E concentrations, correlations of the quotient of circulating vitamin E concentrations, and linear regression-derived standardized regression coefficients in which associations are adjusted for total cholesterol and fasting triglycerides with circulating concentrations of fasting lipids, components of the metabolic syndrome, and circulating vitamin concentrations. We found that otherwise strongly positive correlations of fasting lipids with vitamin E became inverse after correction for total cholesterol plus fasting triglycerides, indicating potential overadjustment, but this could not be overcome by adjustment via linear regression. We consistently found highly significant positive associations for α-tocopherol with vitamins of the one-carbon pathway and an inverse association with homocysteine. We also consistently found highly significant positive associations of γ-tocopherol with components of the metabolic syndrome and highly significant inverse associations with vitamins of the one-carbon pathway and positive associations with homocysteine and methylmalonic acid. In conclusion, the results of our analyses indicate that double correction for variance shared by total cholesterol and fasting triglycerides may indeed be a problem in the correct interpretation potential relations of circulating vitamin E concentrations with biological variables in the lipid domain in epidemiological studies, while other domains seem relatively undisturbed. In these undisturbed domains, we found indications of positive health associations for α-tocopherol with vitamins in the one-carbon pathway and adverse health associations for γ-tocopherol in the domain of the metabolic syndrome and vitamins in the one-carbon pathway. In conclusion, in the population that we investigated, γ-tocopherol may serve as a biomarker for intake of a generally unhealthy diet, while the opposite is true for α-tocopherol.